Photograph by Shadrack Nkomo © Bailey's African History Archive. Numerous factors characterised the intensification of the freedom struggle against the National Party government in the 1980s. This decade witnessed an increase in the armed struggle combined with mass politicisation of the oppressed peoples. The 1983 constitution was roundly criticised in opposition circles for its unrepresentative character. Relative to the earlier period's infiltration of Umkhonto we Sizwe (MK) guerrillas into the country increased. With greater resources and sophistication, MK cadres stepped up their attacks, aiming more daringly for symbolic military targets that rallied black opinion behind the ANC. For instance, the car bomb explosion in front of the South African Air Force Headquarters and the South African Defence Force (SADF) Military Intelligence Headquarters in Pretoria on 20 May 1983 killed 19 and injured over 200 SADF and South African Police (SAP) personnel. 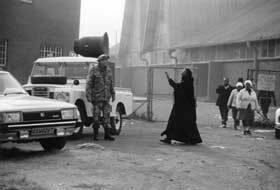 This was the first time the ANC and its military wing, MK attacked apartheid forces and civilian lives in an attempt to inflict damage on both 'hard' and 'soft' military targets, including those situated in the heart of urban white South Africa. In response, the Apartheid government intensified its crackdown on political activists. On 9 June 1983, Jerry Mosolodi, Terry Mogerani and Thabo Montaung were executed for their part in an attack on Wonderboom police station. Secret government units killed activists and bombed their homes. The Pretoria attack led to a punitive air raid on alleged ANC facilities in Maputo. It increased the government's determination to cut links between the ANC in exile and its networks within South Africa. The Apartheid regime gave extensive support to rebel organisations such as the Mozambican National Resistance Movement (RENAMO) in Mozambique and the National Union for the Total Independence of Angola (UNITA) in Angola. Accelerating its campaign against Mozambique by increasing its support for the anti-FRELIMO (Liberation Front of Mozambique) guerrillas of RENAMO, the South Africans brought a vulnerable Mozambique to agree to a mutual non-interference pact, at Nkomati in March 1984. Under the terms of the Nkomati Accord South Africa was to terminate its support for RENAMO. In return Mozambique agreed to close ANC transit facilities for guerrillas within its borders. Pretoria believed that the removal of the Mozambican infiltration route into South Africa would cripple the ANC's ability to operate inside the country. As 1984 progressed, black opposition escalated. On 6 April the buildings of the Administrative Council in Bloemfontein were attacked and on 13 May a Durban fuel storage depot was sabotaged. Furthermore, on 3 September 1984, the day the new constitution was promulgated by the Government; Sharpeville embarked on a local rent boycott. The rent boycott was organised by the Vaal Civic Association, a United Democratic Front (UDF) affiliate to protest the increased charges imposed by the new Community Council. The ANC called on residents to "make townships ungovernable" by destroying the Black Local Authorities. Councillors and police were asked to resign their positions. Municipal buildings and homes of African Councillors and collaborators were attacked. As the state's administrative system broke down, people established their own democratic structures, street committees and people's courts, to administer their communities, Troops and police who had moved into the townships at the end of 1984 engaged in running battles with youths in an effort to re-establish control. An atmosphere of mass insurrection prevailed in many townships and rural towns across the country during 1985 and 1986 as mass struggles and the armed struggle began to support one another. 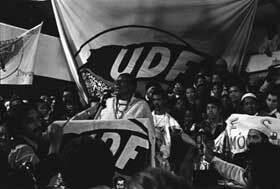 Frances Baard speaking at the launch of the UDF © Rashid Lombard. In the 1980s community, civic, student, youth, cultural, sports and women's organisations were established all over South Africa. The formation of the United Democratic Front (UDF) in 1983, an extra-parliamentary organisation served as an umbrella organisation of anti-apartheid groups. The UDF was launched at Mitchell's Plain in Cape Town. About 600 delegates from more than 230 organisations and a crowd of about 13 000 people converged on the area. There were delegates representing students, youth, worker, civic, women's, cultural, religious, and sport and trade union organisations. The gathering was the largest of anti-apartheid groupings since the mass meetings of the Congress Alliance in the 1950s. The initial aim of the UDF was to oppose the government's tricameral parliamentary proposals (a parliamentary system consisting of Indian and Coloured people as well as existing White government members) but in a short time it became the leading anti apartheid political movement within the country, with more than 1.5 million supporters. It mobilised nationwide resistance, led a series of boycotts, and became involved in labour issues. While the UDF was non-aligned, most of its leadership and affiliates were either members of the underground ANC or sympathetic to it, and principles of the ANC's Freedom Charter were endorsed. Civic organisations had been formed to support education struggles. Massive national school boycotts erupted in the townships in 1984 and 1985, with women playing a crucial role. The freedom struggle in South Africa highlighted racial and class oppression as key causes of poverty, inequality and a lack of rights for most South Africans especially women. For the most part, men continued to dominate trade unions and other formal and informal political organisations. National structures, trade unions, student, civic and women's organisations grew despite State repression, including states of emergency, bans, detentions and assassinations of political activists. In addition to being active in these organisations as workers, students and community activists, women also organised themselves in separate structures, in women's forums in trade unions, and in women's wings of liberation movements. In establishing their right as women to join trade unions and political organisations alongside men, the principle of women's equality was established. This became an integral part of South African political philosophy when the UDF was formed. The government held the UDF responsible for the riots that swept the country after September 3 1984 as the unrest in the Black townships grew into a nationwide uprising surpassing that of 1976. Students boycotted schools. Communities organised strikes against rent increases. September 1984 witnessed widespread disturbances against the Apartheid system in the Vaal area (now Gauteng Province) and in many other parts of the country. The southern Vaal campaign typified the new pattern of protest that grew throughout South Africa in 1984-85. It consisted of "stay-at-homes", rolling mass action challenging the police patrolling the townships, and attacks on the businesses, houses, and African persons charged with collaborating with the new Community Council system. On September 3 1984, major protests broke out in Lekoa (the black municipal region of the Vaal which included the townships of Sebokeng, Sharpeville, Evaton, Boipatong and Bophelong). Lekoa workers were among some of the lowest paid in the country. The average rent for residents in Lekoa was R62.56, which was R10 higher than most black townships in the country and twice the national metropolitan average for blacks. In addition to the rent, all Lekoa households had to pay fees amounting to R51.20 that included electricity, service charges and a tariff for the wiring of houses. Kuzwayo Jacob Dlamini then deputy mayor of Lekoa was probably the highest paid resident in Sharpeville. Black councillors in the townships were seen as corrupt and self-enriching at the expense of the poverty-stricken residents. Dlamini in particular was considered unsympathetic to the people and when the rent increase was announced by the Lekoa Mayor, Mahlatsi, in 1984, the residents reacted by embarking on a massive rent boycott. Dlamini, a resident of Sharpeville was an obvious target of the protest. On Monday, 3 September, black workers in the Vaal Triangle observed a stay-away in protest against the rent increases announced by the Lekoa Council. No public transport was allowed to operate. Protest marches took place in all the townships in the Vaal, but it was in Sharpeville that things took a horrific turn. The initial plan was to march "peacefully, with a strong presence", to the administration building. The departure point was the police station. As the demonstrators reached Nhlapo Street, where Dlamini lived, someone shouted "This is where Dlamini the sell-out lives" and the crowd started stoning the house. Dlamini subsequently opened fire on the crowd, angering them even more. Petrol bombs were thrown at the house, which caught fire. The crowd grabbed and disarmed Dlamini and the stoning continued until he was unconscious. Meanwhile, his car was pushed onto the street, rolled over onto its side and set alight. Some members of the crowd dragged Dlamini, drenched him with petrol and set him alight. When the police arrived at 9am, Dlamini was already dead and rioting had broken out. wo months later eight people were arrested in connection with the Dlamini murder. Two of the accused, Christian Mokubung and Gideon Mokone were sentenced to eight years in prison. The remaining six became known as "The Sharpeville Six". The Sharpeville Six drew national and international headlines when they were sentenced to death by hanging, even though they all maintained that they were nowhere near the scene of the murder. There was not enough evidence to warrant the death penalty since the court could not prove that the six had murdered Dlamini. Even though none of the 'Sharpeville Six' belonged to any political party, some political parties claimed that they were their members and the government saw their trial as political. Many countries that had already adopted sanctions against the government for various human rights violations threatened South Africa with further sanctions if the Six were hanged. In London and other places protestors supported the Sharpeville Six. Canada, Japan, the United States of America (USA), Australia, Austria, the Netherlands, Norway, Sweden, Switzerland and Israel all called for State president, PW Botha, to show mercy for the Six. Local and international churches and in South Africa organisations such as the UDF, the Azanian People's Organisation (AZAPO) and COSATU, all called for mercy for the Six. This pressure caused the government to commute the sentence from the death penalty to long terms of imprisonment ranging from 18 to 25 years. Locally, MK operations increased dramatically in response to the Vaal Uprisings. Their actions included engaging SADF and SAP personnel and sabotaging economic and military installations, exemplified by the limpet mine explosions of 17 March and 30 April 1985. The former exploded under a South African Police vehicle in Mamelodi and the latter went off at an Anglo American building in Johannesburg, causing extensive damage. Local grievances became the vehicle for protest against the apartheid system as a whole, spreading from township to township through a population mobilised by student participation in school boycotts and broader involvement in the anti-constitution campaigns. The UDF coordinated the Transvaal (now part of Gauteng Province) stay-at-home of November 5-6, 1984, in which an estimated 800 000 participated. Shortly afterwards black resistance was given a boost when the Nobel Peace Committee announced that Bishop Tutu had been awarded the Nobel Peace Prize, joining Chief Luthuli as the second South African to receive this prestigious award. Tutu was already engaged in the struggle with the clergy against the government. Bishop Tutu gave new hope to both internal and external opponents of the government. His message for urgent change in government policy, including the release of political prisoners and the end of the ban on political organisations, was punctuated, in 1985, by on-going MK sabotage attacks (e.g. the Amanzimtoti bomb attack). These attacks demonstrated that the Nkomati Accord had not diminished the ANC's ability to operate inside the country. However, on 18 October 1985, Malesela Benjamin Moloise was executed by the apartheid government, in defiance of international calls for clemency and the release of major political figures. 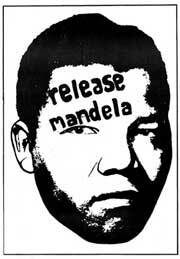 1980s, release Mandela poster. © unknown. By the 1980s, although Mandela was in prison, Tambo in exile, and the ANC banned and demonised by the government, the organisation's stature in South Africa had never been higher. Early in 1985 the government permitted Lord Bethell, a British Conservative Member of Parliament (MP), to interview Mandela in Pollsmoor. Pollsmoor was the mainland prison to which Mandela and five others had been transferred in 1982. Lord Bethell joined many in urging the South African government to release Mandela in the interests of achieving a negotiated solution. On January 31, 1985, President P. W. Botha responded by offering to free Mandela in return for his renouncing the use of violence - an offer that Mandela refused. He would never accept conditional release. In a carefully crafted response, delivered publicly by his daughter Zindzi to a rally of UDF supporters on February 10, 1985, Mandela rejected Botha's conditions, re-affirming his commitment to the ANC and its goals. He demanded that the government release all political prisoners and end the ban on the ANC. Nelson Mandela quickly became the world's most famous political prisoner and emerged as the central symbol of the intensified anti-apartheid struggle in South Africa - despite his inability to speak directly to the public. Mandela's continued principled stand further enhanced his eminent position and deepened Botha's dilemma. Botha's unsuccessful public exchange with his most prominent political prisoner implicitly confirmed Mandela's centrality in the political process. With Botha ignoring calls for democracy there was an increase in popular uprisings and unrest. The government reacted harshly to this mass unrest by detaining leaders of the UDF, sixteen of whom they charged with treason and terrorism. The army was deployed in the townships to augment over-extended police patrols. Poorly trained in crowd control, policemen and soldiers increasingly resorted to using live ammunition in place of tear gas and rubber bullets. The ban on political meetings continued and the death toll and the number of injured mounted. Funerals became rallying points for anti-government gatherings. Under attack, many community councilors and policemen were forced to seek sanctuary outside the townships, and the administrative structures of most of the Community Councils disintegrated. On 16-23 June 1985 approximately 250 ANC delegates met in Kabwe, Zambia for a National Consultative Conference since the Morogoro Conference held at Morogoro, Tanzania, from 25 April to 1 May 1969. At the conference, the ANC continued to call for the intensification of the armed struggle in order to make the country even more ungovernable. Faced with the collapse of its authority in the townships, the continuing prospect of spreading violence, and an increasingly uneasy white population, the government responded with further repression. On July 20, 1985, it declared its first state of emergency over many parts of the country, especially in the thirty-six most affected magisterial districts. Within six months of the state of emergency, security forces received expanded powers of arrest and detention and full immunity for their actions. Hundreds of arrests followed. The strength and breadth of Black resistance in late 1984-85 had a profound psychological impact on broad segments of the white population. The white community realised that the status quo could not be maintained and that new means had to be found to address African demands. In the eyes of many, the political initiative was shifting from the government to the forces of black resistance. Various prominent whites began looking for ways to engage in dialogue with the ANC. Delegations of white South Africans, from leading English-speaking businessmen, Afrikaners, to Progressive Federal Party politicians and clergymen, travelled to the headquarters of the ANC in Lusaka and in Dakar, Senegal, to talk to the exiled leaders. The government criticised this direct contact with the exiled ANC leaders and they even blocked the visits of Afrikaner student leaders by withdrawing their passports. However, it was clear that representatives of both the white opposition and the white establishment were ready to explore and negotiate 'transition' with the ANC. At the same time, Winnie Mandela embarked on a sustained public campaign aimed at challenging and embarrassing the government. She defied her banning order and in August 1985 she moved back to Soweto from internal exile in Brandfort. She finally succeeded in getting her banning order lifted in July 1986. Local UDF affiliates continued to organise rent boycotts and consumer boycotts of white-owned shops. School boycotts spread even to rural communities, with new demands for "people's education". Despite the state of emergency, black protestors remained unintimidated by the government forces in the townships. After the second state of emergency was declared on 12 June 1986 the press was not allowed to report any incident relating to political unrest. By December eleven newspapers were prohibited from printing non-governmental accounts of the police or the army activities, this went on to cover boycotts and any information relating to civil unrest and detentions. The Government monitored publication of any information related to 'unrest activities' and on 25 October 1985, the South African government banned all television and media coverage of demonstrations. At the same time, it stepped up its efforts to detain activists and prevent demonstrations. Despite the government's continued claims that the media in South Africa was free, the independent media in South Africa was forbidden by law not to report on the state of Emergency in the country. The state owned South African Broadcasting Corporation (SABC) served to provide daily propaganda in support of the Government measures. This situation led to a growth of progressive publications known as the alternative press in response to the blanket on information. Many of these organisations received financial support from sympathetic sources overseas. In this way, despite government crackdown on media reporting, people were kept informed despite the state of emergency. The South African alternative press in the 1980s served an important role to undermine the apartheid regime's propaganda campaign. Every act of censorship to limit and crush this free media was responded to with greater creativity. Some alternate publications, responded by publishing blank pages, to demonstrating its attitude to censorship. The Weekly Mail (now Mail and Guardian) came into existence in the mid 1980s when resistance newspapers like Grassroots, The New Nation, South and New African were forced to close down by the government. hroughout the world, the media published images of the struggle. Images showed unarmed Black demonstrators, being teargased and shot at by the South African police and military. In addition, the media aired and published defiant press conferences being addressed by Winnie Mandela. She would report on her husband's (Nelson Mandela) status after her visits to Pollsmoor Prison and would forthrightly condemn government actions. South Africa's image was further harmed by the accelerating capital flight and a precipitous drop in the value of the rand in one of its worst periods of recession. The alternate press was at the centre of the confrontation between Afrikaner Nationalism and Black Nationalism. The government's primary motivation for repressing political expression was to prevent Blacks from sharing ideas about political alternatives or using the printed word to report their affairs and common problems. Suppression of black perspectives was considered essential to the maintenance and, by extension, the very survival of Afrikaner dominance. Almost any black political viewpoint was viewed as an aspect of African Nationalism, something to be resisted and extinguished whenever and wherever it appeared. Anti-apartheid TV and media correspondents were banned or placed under house arrest under the Internal Security Act. Ordinary people could be placed in detention or would sometimes draw unusually heavy prison sentences (of up to 2Â½ years) for possession of a single banned book. The State was complicit in encouraging violence between political organisations, for example, UDF supporters and the Inkatha Freedom Party (IFP). Black vigilantes and Community Council supporters received tacit police license to attack Black opposition figures, particularly in those townships where opposition had been the fiercest. Because the struggle for people's power in the 1980s shook the foundations of the Bantustan system, the regime tried desperately to save it by supporting these vigilante groups and suppressing popular resistance including the independent media. These incidents were rife in Natal (now KwaZulu Natal) where the struggle for people's power was met with violence by Inkatha warlords who were opposed to the growth of community organisations. This conflict led to a bitter war in Natal, where thousands lost their lives. The Truth and Reconciliation Commission (established in a democratic South Africa) subsequently revealed that the Apartheid government sponsored Inkatha to fight the ANC, and that the South African Police and the KwaZulu Police played active roles in this war. South Africa's largest national trade union gathering took place in December 1985 when the Congress of South African Trade Unions (COSATU) was founded. COSATU brought together different trade unions and smaller independent unions into a half-a-million-strong national trade union federation. AZAPO-oriented trade unions refused to join, and merged with other smaller, like-minded, independent unions to form the rival National Council of Trade Unions (NACTU). Responding to demands from its membership, COSATU stated that it would not focus simply on wages and working conditions. COSATU's power was emphatically demonstrated on May 1, 1986, when an estimated one and a half million workers responded to its call for a stay-at-home. Through the stay-away and the bitter school boycott, trade union activism stretched the limits of the state of emergency bans on political activity. Throughout the anti-government demonstrations, religious leaders, such as Bishop Tutu and Reverend Boesak and others, played prominent roles in articulating opposition to government and protecting alleged collaborators from further injury at the hands of angry township crowds. Their voices strengthened that of the unions. With regard to the school boycott's, leadership of the newly created National Education Crisis Committee, persuaded students to return to school against a backdrop of vague government promises of reform and a commitment from black organisations to establish alternative and parallel structures of popular education. The hallmark of the new upsurge was the direct action taken by township activists in confronting Community Council collaborators and in creating new popular institutions in place of the discredited Community Councils. Newly formed street committees co-ordinated the implementation of the local grass-roots programmes and facilitated mobilisation for protest. In some areas ad hoc "people's courts" passed judgements against residents who were perceived to be government collaborators. Increasingly, spontaneous popular protests were used to channel anger against the Apartheid system. In numerous well-publicised incidents, the symbol of the new wave of resistance became the "necklace" i.e. the gasoline-soaked tyre placed around the neck of an alleged collaborator who was tried on the spot by accusers and then set alight to burn to death. Black militants were clearly seizing the initiative from the government and setting their own agendas, a development that marked a new and higher stage of black resistance. From the exiled ANC came calls for a "people's war", for a revolutionary rebellion to topple the government. The government was beginning to feel the pressure especially the demands that all political prisoners be released, as a precondition for negotiations between the government and the ANC. On March 7, 1986, the government was forced to end the partial state of emergency, partly because of Commonwealth efforts of mediation between the South African government and its opponents. The Commonwealth Conference held in October 1985 had established a seven-member Eminent Persons Group (EPG). Members were on a fact-finding mission in South Africa to devise a formula for a negotiated settlement. The South African government, under the threat of possible Commonwealth-mandated economic sanctions, gave the EPG unprecedented access during several visits to the county in late 1985 and early 1986. Discussions were held with cabinet ministers and Nelson Mandela. The EPG hammered out a "negotiating concept" under which Mandela and other political prisoners were to be freed and the bans on the ANC and other organisations lifted in return for the "suspension" of violence during negotiations on further measures. In principle Mandela and the ANC leadership in exile endorsed the concept, but the cabinet refused to accept it. Instead, on May 19 1986, the government launched simultaneous raids on alleged ANC facilities in Gaborone (Botswana), Harare (Zimbabwe) and Lusaka (Zambia), the same day that the EPG arrived in South Africa after discussions with the ANC in London. The EPG mission finally withdrew because the Apartheid government was forcefully orchestrating its unwillingness to engage in negotiations on any terms other than its own. 1985, Police raid the UDF offices. © The Star newspaper. Challenged by continuing unrest throughout the country and facing the tenth anniversary of the 1976 June 16th Soweto Riots, the government followed up its renewed attacks on the ANC by imposing a nationwide state of emergency on June 12, 1986. Sweeping through the townships, the police apprehended and held hundreds of activists and detained thousands of youths and children, some as young as nine years old. 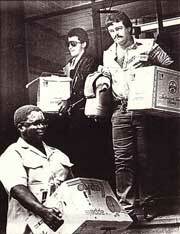 1987 saw the highest number of COSATU-organised strikes ever, including a strike by over 300 000 mineworkers. The state of emergency was used to detain thousands of people and to impose political restrictions on organisations. The tension between the liberation fighters and the government continued to rise despite the state of emergency. For example, in May 1987 a car bomb exploded outside the Johannesburg Magistrates Court killing four policemen. In July of the same year the SADF's Witwatersrand Command complex in Johannesburg was severely damaged by a massive car bomb, the SADF refused to divulge the number of casualties. These onslaughts came in the wake of the increased smuggling of arms for the arming of internal MK units from 1986 to 1987. Limpet mines, hand grenades and small arms were increasingly used and landmine incidents occurred frequently in Northern and Eastern Transvaal and in Northern Natal. The highest number of incidents occurred in September and October 1988, just before the municipal elections. The People's Army concept was further developed with the establishment of self-defence units (SDUs) and combat groups, with locally-based MK members as the core. The new structures were manned by members trained internally and in neighbouring states. From 1988 onwards the constitutionally "independent" Transkei was increasingly used by MK and Azanian Peoples' Liberation Army (APLA - the military wing of the Pan-Africanist Congress/PAC) as a base for the training of recruits and for armed actions in the Eastern and Western Cape and in Natal. In 1989 a large group of MK combatants attacked the South African Air Force's secret radar installation at Klippan in the Western Transvaal. Much damage was done and the amount of casualties was not disclosed. After 29 years, negotiations between the ANC and the Apartheid government began. The aim was to find amicable peaceful solution to the political deadlock in South Africa. Negotiations also marked the end of the state of emergency. During the 1980s MK's role was always enforced and complemented by the Mass Democratic Movement (MDM). The Mass Democratic Movement was the name of an informal coalition of anti-apartheid groups during the 1980s. The MDM was established as an anti-apartheid successor to the UDF after the February 24, 1988 emergency restrictions effectively banned the UDF and several other opposition groups. The UDF's political activities had been effectively proscribed and many of its affiliates were reorganised under the guise of a new political coalition, the MDM. Even after 1988, the MDM was a temporary coalition of anti-apartheid activists with no permanent constitution, no official membership, no national or regional governing body, and no officeholders. However, one condition for affiliation with the MDM was adherence to the provisions of the ANC's Freedom Charter. The MDM gained prominence in 1989 when it organised a campaign of civil disobedience (passive resistance) in anticipation of the national elections scheduled to take place in September of that year. Defying the state-of-emergency regulations in effect at the time, several hundred Black protesters entered whites-only hospitals and beaches. During that month, people of all races marched peacefully in several cities to protest against police brutality and repressive legislation. When the UDF was unbanned in February 1990, most MDM leaders and many members rejoined their former organisations. The UDF officially disbanded on August 20, 1991, declaring that its major objectives had been fulfilled. The Prime Minister, P. W. Botha, was compelled to resign on August 14, 1989 partly due to a stroke he suffered in January 1989 coupled with his failure to contain political violence and resistance in South Africa in this era. On 15 August 1989 Frederik Willem de Klerk was sworn in by the NP as acting State President. De Klerk was behind the era of negotiation that characterised developments before and after 1990. At no time had apartheid been resisted by as large and united a constituency as in the 1984-1990 period, inspite of PW Botha's vicious and repressive reign. By 1990, as resistance mounted, it was becoming clear that the regime was on the verge of giving in to popular political demands, as millions of ordinary people in the townships, factories, urban and rural areas waged determined struggles against the system. The insurrections of the 1980s were fundamentally different from the previous struggles against white minority rule, both in their scope and militancy. They represented the most serious challenge to apartheid that had ever been conducted up to that time.